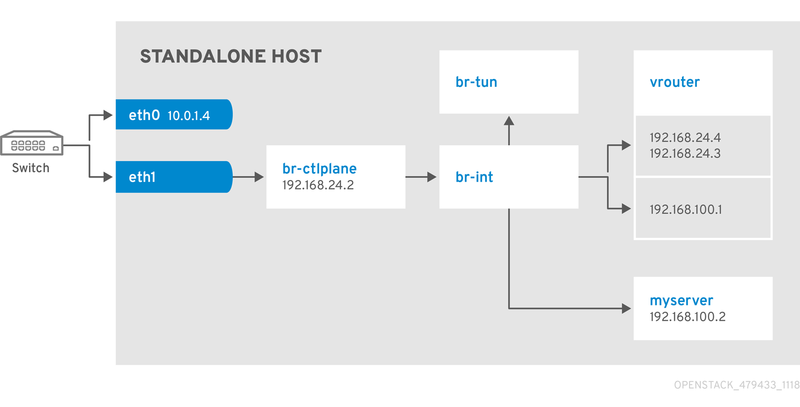 The all-in-one installation method uses TripleO to deploy OpenStack and related services with a simple single-node environment. Use this installation to enable proof-of-concept, development, and test deployments on a single node with limited or no follow-up operations. Before you begin, ensure that you have a system with two network interfaces and a base operating system installed. This section contains information about installing, configuring, and deploying a simple single-node OpenStack environment. In this scenario, there is no pre-existing Undercloud dependency. Instead, the installer runs an inline heat-all instance to bootstrap the deployment process and convert the selected Heat templates into Ansible playbooks that you can execute on a local machine. Use the all-in-one OpenStack installation for basic testing and development. The all-in-one installation is a good starting point and test environment for OpenStack, but if you want to perform complex operations, you must deploy a production-level scaled cloud installation. Enable the repositories necessary to deploy the all-in-one OpenStack installation. Install the TripleO command line interface (CLI). Configure basic network configuration and deployment parameters for your all-in-one OpenStack installation. Deploy the all-in-one OpenStack installation. Playbooks that you can use to run the small-footprint installer in a container and generate Ansible playbooks. The all-in-one Red Hat OpenStack installation does not require configuration pre-deployment or post-deployment. However, this guide also contains information about configuring roles and services that you can use to experiment with OpenStack. You can create custom composable roles and deploy specific services for each role. This installation applies Ansible playbooks automatically with the deployment command. However, you can also direct the deployment command to output Ansible playbooks that you can use on other instances. For example, you can complete testing in the all-in-one installation, and then apply the verified Ansible playbook to other instances. Before you can begin configuring, deploying, and testing your all-in-one OpenStack environment, you must install the necessary packages and dependencies. Replace <VERSION> with the version of your OpenStack installation. The all-in-one OpenStack installation is a Technology Preview feature in Red Hat OpenStack Platform 14. To deploy your all-in-one OpenStack environment, run the following command. Ensure that you include all .yaml files relevant to your environment. The deployment command applies Ansible playbooks to the environment automatically. However, you can modify the deployment command to generate Ansible playbooks without applying them to the deployment, and run the playbooks later. Include the --output-only option in the deploy command to generate the undercloud-ansible-XXXXX directory. This directory contains a set of Ansible playbooks that you can run on other hosts. The custom configurations in this guide use Heat templates and environment files to define certain aspects of the Overcloud. This chapter contains a basic introduction to Heat templates so that you can understand the structure and format of these templates in the context of Red Hat OpenStack Platform. The purpose of a template is to define and create a stack, which is a collection of resources that Heat creates, and the configuration of the resources. Resources are objects in OpenStack and can include compute resources, network configurations, security groups, scaling rules, and custom resources. Parameters are settings passed to Heat. Use these parameters to define and customize both default and non-default values. Define these parameters in the parameters section of a template. Resources are the specific objects that you want to create and configure as part of a stack. OpenStack contains a set of core resources that span across all components. Define resources in the resources section of a template. These are values passed from Heat after the stack creation. You can access these values either through the Heat API or through the client tools. Define these values in the output section of a template. Red Hat OpenStack Platform contains a core Heat template collection for the Overcloud. You can find this collection in the /usr/share/openstack-tripleo-heat-templates directory. There are many Heat templates and environment files in this collection. This section contains information about the main files and directories that you can use to customize your deployment. This file is the main template file used to create the Overcloud environment. This file uses Jinja2 syntax and iterates over certain sections in the template to create custom roles. The Jinja2 formatting is rendered into YAML during the overcloud deployment process. This file is the main environment file used to create the Overcloud environment. This file contains a set of configurations for Puppet modules on the Overcloud image. After the director writes the Overcloud image to each node, Heat starts the Puppet configuration for each node using the resources registered in this environment file. This file uses Jinja2 syntax and iterates over certain sections in the template to create custom roles. The Jinja2 formatting is rendered into YAML during the overcloud deployment process. This file contains definitions of the roles in an overcloud, and maps services to each role. This file contains definitions of the networks in an overcloud and their properties, including subnets, allocation pools, and VIP status. The default network_data.yaml file contains only the default networks: External, Internal Api, Storage, Storage Management, Tenant, and Management. You can create a custom network_data.yaml file and include it in the openstack overcloud deploy command with the -n option. This file contains definitions of the metadata for your overcloud plan, including the plan name, the main template that you want to use, and environment files that you want to apply to the overcloud. This file contains a mapping of environment files for an overcloud plan. Use this file to describe and enable environment files in the director web UI. If you include custom environment files in the environments directory but do not define these files in the capabilities-map.yaml file, you can find these environment files in the Other sub-tab of the Overall Settings page on the web UI. This directory contains additional Heat environment files that you can use with your Overcloud creation. These environment files enable extra functions for your OpenStack environment. For example, you can use the cinder-netapp-config.yaml environment file to enable Cinder NetApp backend storage. If you include custom environment files in the environments directory but do not define these files in the capabilities-map.yaml file, you can find these environment files in the Other sub-tab of the Overall Settings page on the web UI. This directory contains a set of Heat templates that you can use to create isolated networks and ports. This directory contains puppet templates. The overcloud-resource-registry-puppet.j2.yaml environment file uses the files in the puppet directory to drive the application of the Puppet configuration on each node. This directory contains Heat templates for all services in the composable service architecture. This directory contains templates that you can use to enable extra functionality. 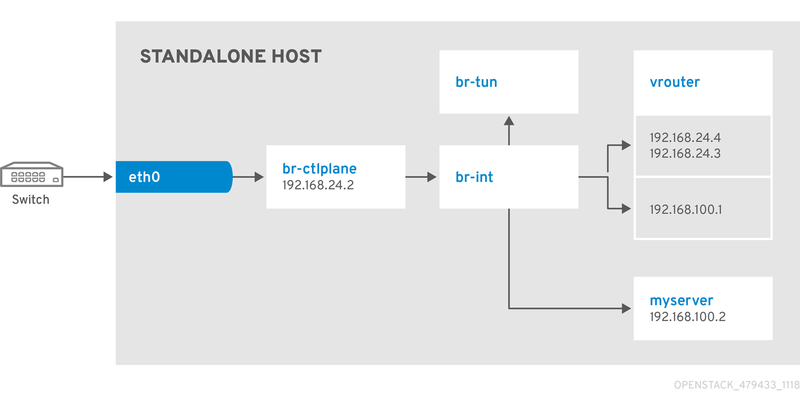 For example, you can use the extraconfig/pre_deploy/rhel-registration directory to register your nodes with the Red Hat Content Delivery network, or with your own Red Hat Satellite server. Red Hat OpenStack Platform usually consists of nodes in pre-defined roles, for example, nodes in Controller roles, Compute roles, and different storage role types. Each of these default roles contain a set of services that you define in the core Heat template collection. However, the all-in-one OpenStack installation runs on a single node that contains all of the OpenStack services. The Standalone.yaml role file in the /usr/share/openstack-tripleo-heat-templates/roles directory is the configuration file that contains all of the services in the all-in-one installation. You can duplicate and modify the Standalone.yaml role file to enable and disable services in your installation. A standalone role that includes a minimal set of services. Use this role for testing in a single node configuration with the 'openstack tripleo deploy --standalone' command, or with the 'openstack overcloud deploy' command. Controller role that contains all of the services for database, messaging and network functions. Use the following examples to understand how to launch a compute instance post-deployment with various network configurations. Follow this example to understand how to launch a Compute node with the private tenant network and the provider network after you deploy the all-in-one OpenStack installation. This example is based on a single NIC configuration and requires at least three IP addresses. One IP address for the OpenStack services. One IP address for the virtual router to provide connectivity to the tenant network. This IP address is assigned automatically in this example. At least one IP address for floating IPs on the provider network. # from the allocation pool for the subnet. Replace FLOATING_IP with the address of the floating IP that you create in a previous step. Follow this example to understand how to launch a Compute node with the provider network after you deploy the all-in-one OpenStack installation. This example is based on a single NIC configuration and requires at least four IP addresses. One IP address for DHCP on the provider network. Replace VM_IP with the address of the virtual machine that you create in the previous step. Follow this example to understand how to launch a Compute node with the private tenant network and the provider network after you deploy the all-in-one OpenStack installation. This example is based on a dual NIC configuration and requires at least three IP addresses on the provider network. One IP address for a gateway on the provider network. One IP address for OpenStack endpoints.